Gift time! Of course all of mine are Stella and Dot, because, duh, I’m obsessed with it. The Clover Initials. Where do I even begin talking about how I feel about these? They are the anti-soccer mom initial jewelry. The ultimate chic-mommy personalization solution. A perfect alternative for those of us who like to have something distinctive but don’t like to look like we shop at the “Things Remembered” kiosk at the mall. When designer Blythe Harris (formerly of LVMH…no big deal) gave us a sneak peek at Hoopla Convention last July, I was instantly in love. With her and the clover initials. She is a genius and so are the designs. I wear mine on a charm bracelet, but they are made to be so versatile you can wear them on a chain as a necklace or as a pair of dangle charms on the Orbit hoop earrings. 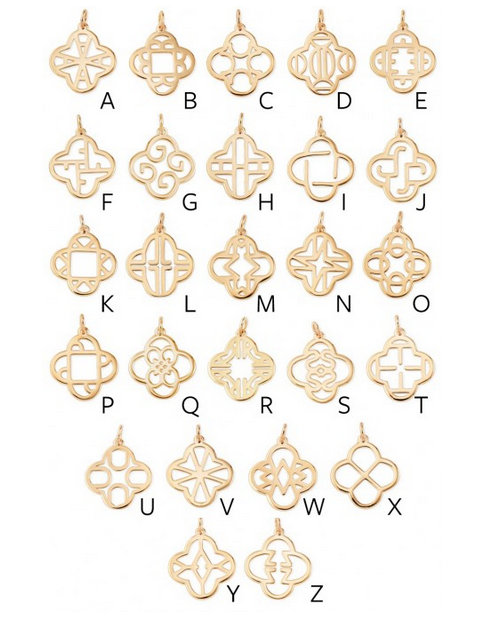 I feel like these are such a chic way to do personalization and subtle enough for someone who has great style but just isn’t a big “jewelry person”. One of my other favorite things about the Fall and Holiday collections is that the pricing has changed so there is a huge range of affordable but really special, fresh, sparkly gifts. As a Stella and Dot Stylist, I choose my inventory based on whatever I want to wear so if I’m recommending it, it’s something that I own and love. I don’t talk about it nearly enough here, but if you are curious about what it’s like to be a Stylist, PLEASE for-the-love-of-a-50%-stylist-discount shoot me a message and I’ll try to answer all your questions about how it could fit into your busy ecosystem. I truly love it and it’s been a huge force of happiness in my life! Tell me if you are loving the Clover Initials as much as I am!!! Just looked at your site too. Lots of cool stuff. Thanks for stopping by!